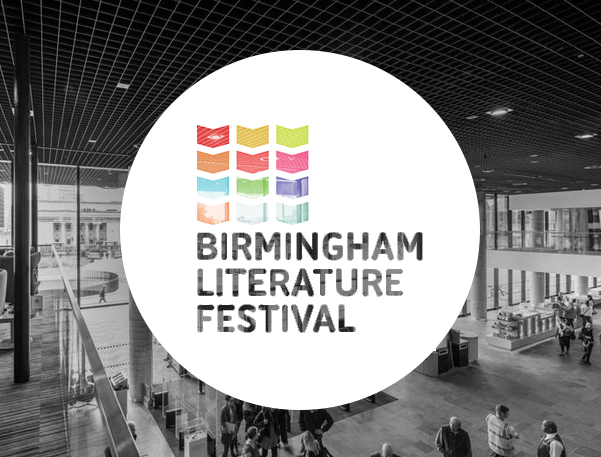 This is the 17th year for Birmingham Literature Festival organised by Jonathan Davidson Director of Writing West Midlands. It was the first literature festival (apart from Hays) that I attended in 2013 and I practically spent the whole season in the library at events. Last year I was fortunate enough to be chosen as 1 of 4 poets who were commissioned by Naked Lungs to write and perform at the festival. This year, I booked my tickets as soon as they were available, due to other performance commitments I was unable to manage many events this year. Tickets are still available and the festival runs until 17th October. It is my pleasure to know some of these writers and I loved discovering stories from voices and pens I haven’t come across too. This event was a real treat, it was a delight to listen to Rita Dove and discover her poetry. Jo Bell opened the evening with a great set and rapport with the audience. Serena Arthur provided us with a confident performance of her poems, including one of the poems she won the Young Poet Laureate with and as for Oliver Sullivan, such talent remembering classical poetry. I was already on a high after NPD events the evening before and my night in Birmingham topped up my poetry fuel nicely. I am a little sad that I cannot attend as much as the festival as I would have liked this year. 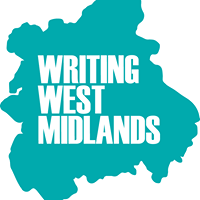 I have had to cancel one of the tickets as I have been asked to cover as an Assistant Writer for Writing West Midlands on the same day. Back at the very beginning of my writing life in 2013 I attended a WWM (Writing West Midlands) network meeting in Hereford at the Courtyard Theatre, later in the year I went to another one in Oswestry to meet Simon Thirsk (Bloodaxe) & Ian Billings. At this meeting I talked to Jonathan Davidson and by January 2014 I had confirmation of working in a voluntary capacity as an Assistant Writer for WWM in Worcester with Ian MacLeod – a Science Fiction writer. I spent a year and half working in this role and this September I became as the Lead Writer for the Worcester Senior Group of Young Writers, 12-16 yr olds. On September 12th I led my first session with this group. It was incredible! My new Assistant Writer is amazing and eager and we had a good number of participants. The next session I have planned is even better. Sessions are held once a month, £6.00 per session and classes run inline with the academic year Sept – June – you can join at any point in the year. We meet in the Oasis Room at The Hive (library) in Worcester. Where it all began – WWM Network Meeting Oswestry – I cannot remember the shoes I was throwing away – but in 2015 my poetry shelves creak with the amount of support I have shown to others (which I course hope will be returned to me on the launch of my own pamphlet)! A funny week this one because it included a major poetry event, the Worcester Poet Laureate Final. I spent most of the week as a bundle of nerves swinging between trying to manifest positive thoughts or not think about it at all! After my poetic adventure at Cannon Hill Park, I felt fairly worn out. To be fair it was the fifth event of last week. This week I had work, two open mics, clothes shopping, appointments for Opticians (who messed up the lenses in my new specs) and at the Hair Salon (dread), as well as tutoring, attempting some writing and learning my poems by heart. I was unfortunately too tired to get to Mouth & Music. At the beginning of the week I was working full time, Monday was a 16 hour day! I rarely do those anymore, unless it involves a desk and my laptop. Both Monday and Tuesday I went straight to bed and slept for a couple of hours. I wanted to get to the ‘Comedy themed’ night and have heard that it was great fun, I was just too tired. Tough call, but as I fell asleep before 10 PM, the right one. 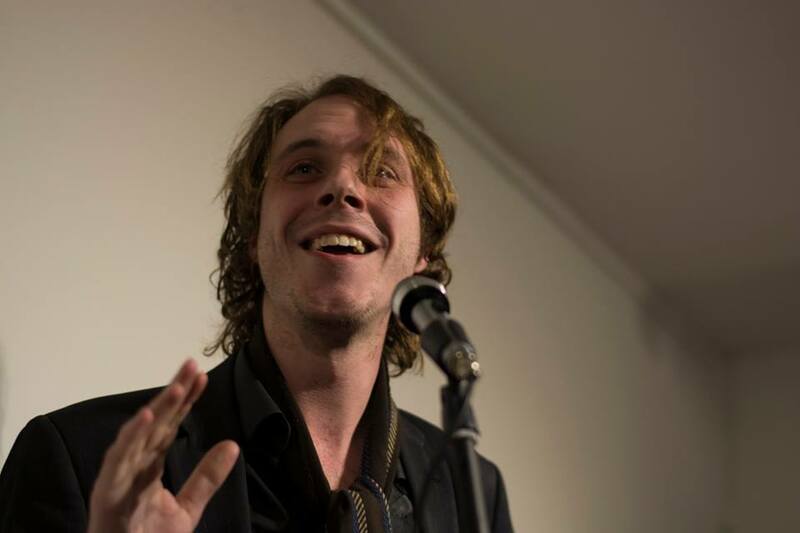 I did manage HOWL – Leon Priestnall’s amazing night of poetry in Birmingham. It was a full audience and a fantastic, lively event. Unhindered Reign are one of the leading spoken word duo’s on the Birmingham scene. Featuring at Spoken word Brum staples such as Level Up and opening for US slam champion Buddy Wakfield at Hit The Ode. With both top Knotch writing and performing styles- tackling issues both social and personal- Luci and Sipho, who make up Unhindered Reign, are two artists not to be missed for anyone who wants to see the best of what UK spoken word has to offer. The man, The moustache, The myth…. You’re never quite sure what he’s going to pull out the bag- or even which of his alter ego’s is going to show up on the night. Rest assured you won’t mistake him in a line up! All headline acts were fab, I particularly liked Unhindered Reign (Luci Hammans and Sipho Eric Dube), as I hadn’t seen them before, I have seen both poets on the circuit but hadn’t seen either perform – together they are… legendary! Currently work for the BBC and George the Poet. Timothy Scotson, Frankie Ryan (Ryan Murray), Nicole Murphy, myself – Nina Lewis, Abbie Foster (who it was a pleasure to meet), Anna Higgins (who has been around poets forever and finally made her debut performance- powerful indeed), Lexia Tomlinson, Leah Atherton, Oakley Flanagan, Tom Crossland and more. An invigorating evening of poetry and an eclectic mix of styles and performances. 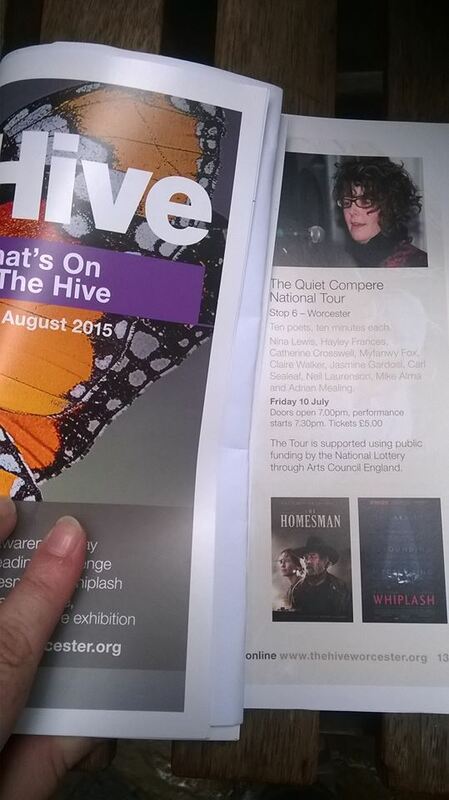 Worcester Lit Fest started on Friday 12th June with the Launch & Poet Laureate final, in which I was placed 3rd. Delighted! Here are links to posts about this event. Saturday there were several events I wanted to attend. It was Caldmore Carnival and a few months ago David Calcutt started working on a group poem using our workshop poetry. We rehearsed a choral reading, sadly I was never able to go as it clashed with the last WWM meeting of the year, an important one in which I said goodbye to Ian MacLeod, the Lead Writer. I take over the group from September. Evesham is also hosting the AsparaWriting Festival at the moment and Lindsay Stanberry-Flynn, a well respected local author had organised an afternoon of poetry. It was Heather Wastie’s first official appearance as Worcestershire Poet Laureate and sounds like it was a great success. 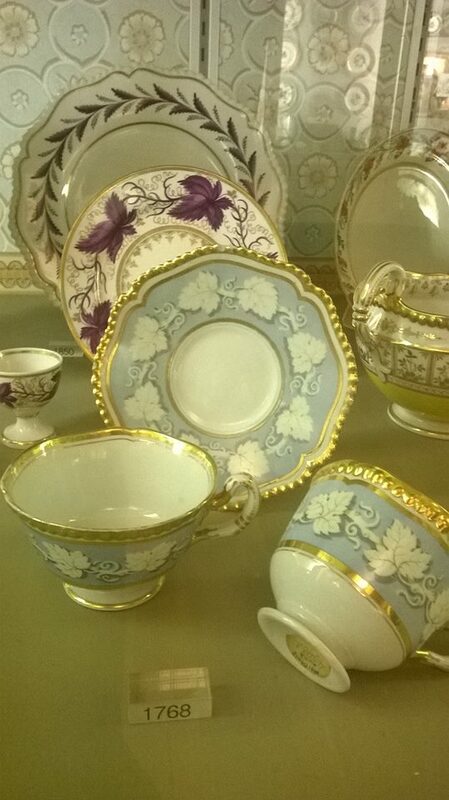 Last night I went to an event ‘A Night at the Museum’ at the Royal Worcester Museum. It was a poetry book launch, to mark the end of Ben Parker’s Residency and celebrate the new Poet in Residence, Dr. Todd Swift, taking up his position. Chloe Clarke, Worcestershire’s Young Poet Laureate was also performing. 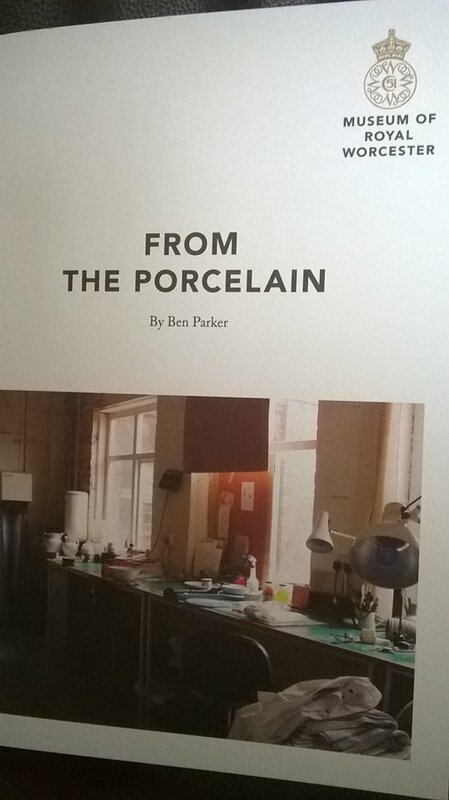 This book launch marks the conclusion of Ben Parker’s tenure as poet-in-residence at The Museum of Royal Worcester. Ben Parker will be reading from a collection of poems produced during his residency, which will be available for purchase for the first time. This event also marks the beginning of Todd Swift’s residency at The Museum, and Todd will be reading from his highly acclaimed poetry. published by tall-lighthouse in October 2012 and shortlisted for the 2013 Michael Marks Award. In 2004 Todd was the Oxfam Poet-in-residence. He blogs at ‘Eyewear’ and runs the indie press Eyewear Publishing. Todd’s PhD in Creative and Critical Writing is from The University of East Anglia (UEA). He was born in Montreal, Quebec. I saw all three perform at Ben’s Book Night at The Hive and was looking forward to relaxing into a chair and listening to them again. Great venue, inspiring art and beautiful words. It was a lovely evening and I treated myself to Ben’s Pamphlet too. All proceeds go towards the museum, a kindness they appreciated.